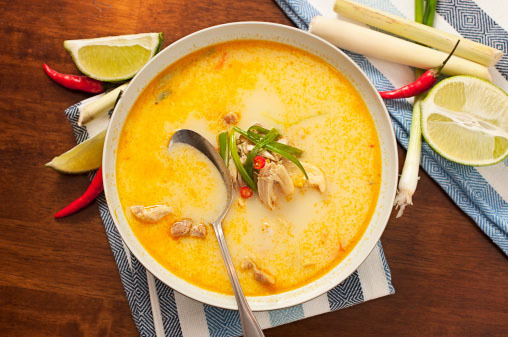 A delicious twist on your typical chicken winter soup, this Thai version delivers even more immune-boosting nutrients with garlic, ginger and lean protein. – Heat your oil in a large saucepan on medium heat. – Add mushrooms, garlic, ginger, red pepper and lemongrass and cook for a few minutes. Add your chillies and cook for a further minute. – Pour in your chicken stock, coconut milk, soy sauce and xylitol and simmer on a low heat for 10 minutes. – Stir in your chicken and heat for a further minute. Remove the lemongrass and top your soup with the green onions, coriander and lime juice. This flavourful soup packs even more of a nutritional punch because of its all-raw ingredients. The high vitamin C content and immune-boosting garlic and cayenne pepper make this a great winter option. It is best served after the flavours have mingled for several hours or overnight, so make it in advance. Enjoy at room temperature or chilled. – Blend together all ingredients except parsley and avocado until smooth. – Chill for a minimum of two hours. – When you’re ready to serve, gently stir in the avocado and parsley or coriander. This is a delicious low-calorie soup for a filling winter meal. Roasting your veggies beforehand really does give a one-up on flavour on what is essentially a very simple soup. Himalayan rock salt and freshly ground black pepper to taste. – Heat your oven to 200 degrees. Place all your veggies, including the garlic, on a tray and dress with the coconut oil. Place your peppers apart and skin-side up. Roast for 20-30 minutes until cooked. Keep an eye on your peppers and pull them out when the skins are blackened. Pop them immediately into a plastic bag and knot. – After a few minutes, unknot the packet and pull the skins off your peppers. They should come off easily. – Pop all remaining ingredients into a blender. You will need to squeeze the roasted garlic out of their skins. Blend until your desired consistency, saving a few basil leaves for garnish. Which recipe are you keen to try? Share your go-to dishes with us #WinterWarmers. Recipes via fitness expert Lisa Raleigh. These recipes look so delicious and easy to make. Need to save these recipe for next chilly winter days . Thank You ! Yummm they all look delish and are packed with a lot of flavours. I’m sure my 8-month old baby will enjoy this too.